The wise King Solomon advocated industry, thrift and hard work as ways to create a prosperous life. His Proverbs point out the connections between personal responsibility and a Godly life – connections that still ring true today. In this modern world, though, managing debt –- not staying out of it – can be a measure of responsibility. A person’s credit score can either open doors or close them. And one of the ironies of the credit reporting system is that the very act of seeking out “good debt” of a mortgage can damage the credit score you need to get that loan. When the process works smoothly, a prospective home buyer applies with a lender and credit scores are checked. If the numbers work out, the loan is approved and the borrower is on the way to buying an investment property or the home of his dreams. But if the application is turned down that means trying again with another lender – or two. Or more. And each new attempt whittles away at the applicant’s credit score a little more. Here’s why. Every time a prospective borrower asks to be considered for a loan, the lender will run a credit check. Each check constitutes a separate credit inquiry on the credit report. And each of those credit inquiries lowers an individual’s credit score by a few points – which add up quickly over an extended period of loan shopping. 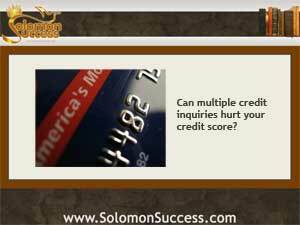 How many points can a credit inquiry cost? That depends on several factors. Though representatives of the Fair Isaac Corp – the FICO that creates the FICO score — say each query deducts on average less than 5 points, some factors on the credit report can cost 5 points or more. These include situations in which a borrower has a very short credit history, with little to offset the deductions or numerous recent delinquencies. Even a lender’s outdated reporting software can cost points. There’s a window of time around a mortgage application that provides a cushion against multiple credit inquiries. If a borrower makes all mortgage inquiries within a 45-day period, all those applications are treated as one inquiry on the credit report. What’s more, inquiries made in the 30 days prior to the first mortgage application are not included in the tally. If a lender uses older reporting software that allows only a 14 –day window for multiple mortgage queries, those queries made in the remaining 30 days will register as multiple requests. Those with higher credit scores most likely won’t feel the bite of a few points for making multiple mortgage applications. But for those whose scores hover on the edge of “subprime” territory – 630 for FICO and 700 for Vantage, the two leading credit scorers –- those points can make a significant difference.